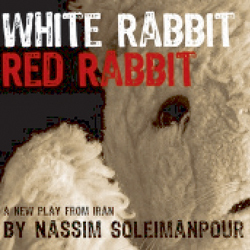 Tehran-based Soleimnapour’s latest production White Rabbit, Red Rabbit is an experiment with roots in improv theatre; a new actor each night, reads the script who delivers the piece cold, in front of a live audience and renders each delivery in itself, unique. Running in the LIFT 2012 festival, at Notting Hill’s Gate Theatre, the play looks at issues of obedience and manipulation. The play requires the performers to know next to nothing about the content and has attracted performers as renowned as Juliet Stevenson, among others. So how does it work? The actor is handed a sealed envelope in front of the audience, inside which will be the script. There has been no rehearsal, no direction and in fact there is no set just an actor and an audience without costume and without other characters on whom to rely. Reading cold is never easy, the play stretches the actor to his limit in front of an audience who knew more about the play than its actor before the start. Imagine being 29 and unable to leave your country. ‘White Rabbit, Red Rabbit’ dissects the experience of a whole generation in a wild, utterly original play. Soleimanpour turns his isolation to his advantage with a play that requires no director, no set, and a different actor for each performance. Volcano Theatre & Necessary Angel co-produced the world premiere of White Rabbit, Red Rabbit in 2011, shown simultaneously at SummerWorks and Edinburgh Fringe Festival. It is now playing around the world. This entry was posted in Six Pillars to Persia and tagged director, interview, Iran, juliet stevenson, nassim soleimanpour, play, podcast, production, Resonancefm, Six Pillars to Persia, theatre, white rabbit red rabbit, writer on January 11, 2013 by sixpillarstopersia.